You cannot access these features from any navigation, but you must type the URL directly in the case of the bulk options or set up a config.php variable. The export and import of portfolios uses quite a lot of computing power. Therefore, these bulk options require even more memory. Please try them first out on a test installation or export / import only a small number of users instead of an entire institution at once. If you need to export the portfolios of multiple users at once, you can do so from the bulk export page. Please remember that this is an experimental feature at the moment. Institution: Choose the institution from the drop-down menu for which you want to export all user portfolios in the Leap2A format. Usernames to export: Alternatively, choose this option if you only wish to export some users’ portfolios. Each username must be on a separate line. Click the Export users button to start the export process. This might take a while. You can look up the usernames on the user search page or if you exported a CSV file of users, you have the usernames in there as well. If you need to import the portfolios of multiple users at once, you can do so from the bulk import page. Please remember that this is an experimental feature at the moment. You must have Leap2A files to import. The import of HTML files is not possible. The easiest option to import user portfolios in bulk is to use the bulk export file as all information is contained therein. If that is not possible, you can create the necessary ZIP file manually. Ideally, you have exported the users you wish to import using the bulk export functionality on the other Mahara instance. Then the bulk export file already contains all necessary files and mappings. Institution: Choose the institution in which the users shall become members. Bulk export file: Choose the bulk export ZIP file which contains all users that shall be created. A new user account will be created for each of them. Email users about their account: Check this option if the new users shall receive an email about their new account. This is especially important if you change their username and if they do not know that their account has been moved. Click the Import button to start the process. Please be patient as the import may take some time. Before importing these new user accounts, you can change the usernames for these new accounts in the usernames.csv file that is included in the bulk export file. 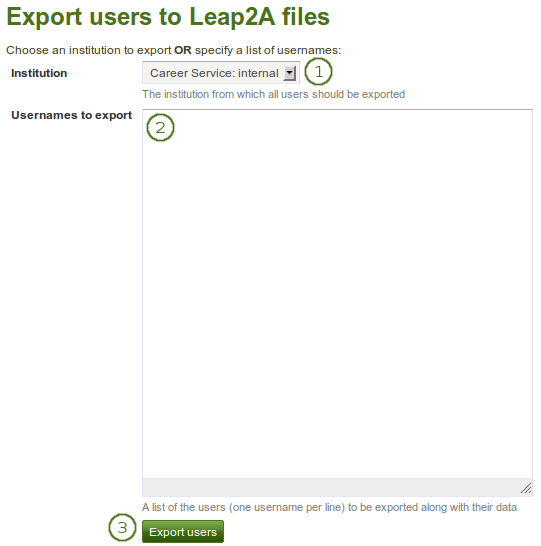 If you want to import user portfolios into one institution using their Leap2A files that you did not receive via the bulk export functionality, you can still import them in bulk. Create a folder, e.g. mahara-bulk-import. Create the CSV file usernames.csv in the folder mahara-bulk-import. Create a line for each user that you are importing that contains the username and the name of the ZIP file that contains the corresponding Leap2A file. Create the sub folder users in it. Do not choose a different name. Place all Leap2A files that you wish to import into one institution into the users sub folder. Make sure that each ZIP file has a corresponding entry in usernames.csv. 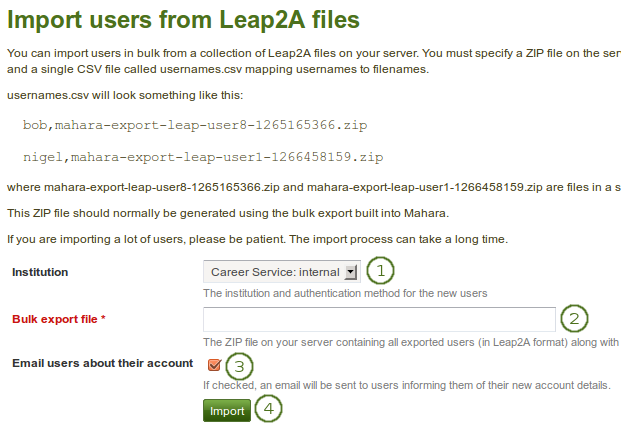 Create a ZIP file from the folder mahara-bulk-import once you have all users in it. Go to [your regular Mahara URL]/admin/users/bulkimport.php. usersuniquebyusername is a config.php setting that should be used with extreme caution as it could be misused. Below is the documentation that can be found in the code. This feature is discussed for example in the discussion topics Mahara Moodle integration and bug? and SSO: Mahara to Moodle. When turned on, this setting means that it does not matter which other application the user SSOs from, they will be given the same account in Mahara. This setting is one that has security implications unless only turned on by people who know what they are doing. In particular, every system linked to Mahara should be making sure that same username == same person. This happens for example if two Moodles are using the same LDAP server for authentication. If this setting is on, it must NOT be possible to self register on the site for ANY institution - otherwise users could simply pick usernames of people’s accounts they wished to steal. That is why you should not see the registration check boxes in any institution if you have this feature turned on.